The San Diego IREM Chapter No. 18 is excited to welcome the IREM Fall Leadership Conference to San Diego. As soon as I stepped out of my Moscow hotel, I knew there was a problem. I could see little in the 5 a.m. darkness, but this much was certain: I had walked out into a full-blown, blinding snowstorm. For centuries our men and women in uniform have defended the freedom we all enjoy, and have done so at great sacrifice. In 1998, members of the San Diego Chapter of the Institute of Real Estate Management (IREM) became concerned that spiraling housing costs combined with welfare reform would put many families on the street. The REstart program was created by real estate management professionals who are using education, training and networking to prepare disadvantaged single parents for a new start in life through real estate. The AMO accreditation recognizes excellence among real estate management firms. Only those firms that achieve the highest level of performance, experience and financial stability and have a CPM® in an executive position can earn the AMO® credential. Join the 527 AMO® firms, representing more than 560 offices worldwide, who hold this distinguished accreditation. Friends of IREM program -- is it for your company? If you are a vendor who would like to become more involved with the San Diego chapter of the Institute of Real Estate Management (IREM), you will want to consider becoming a Friend of IREM. Is Associate Membership for you? Take charge of your career and join the world of savvy real estate management professionals. The Institute of Real Estate Management offers Associate Membership to individuals who are engaged in property, asset and/or facilities management of all property types. This program is for experienced professionals as well as entry-level individuals. 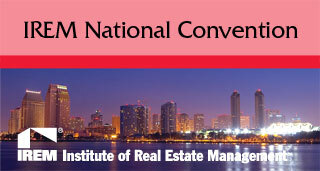 From Oct. 11-15, IREM National will be hosting its fall leadership conference in our beautiful city. The word POSSIBLE has been absent from daily vernacular in the recent past. But at the IREM Fall Leadership Conference, "Mission Possible" is the mantra. It seems like everyone knows of someone -- wife, mother, sister, sister-in-law, daughter, daughter-in-law, niece, cousin, or friend -- who has contracted some form of breast cancer. Many of these women are still alive today due to the great strides by the medical community in working hard to find new treatments and better ways to fight this terrible disease, which strikes 1.3 million people worldwide each year.